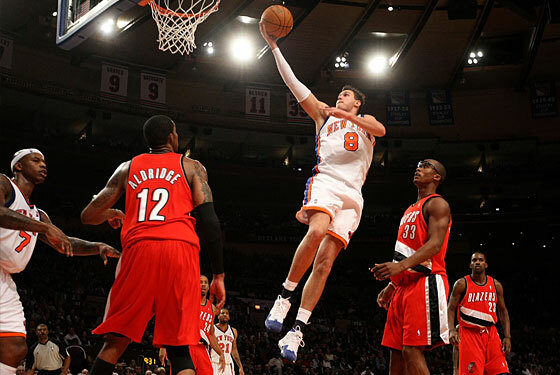 Whimsy Time: Can the Knicks Make the Playoffs? Your New York Knickerbockers are officially hot. They waxed a crippled, limping, leprosy-ridden Portland Trail Blazers 93-84 last night, and they've now won four of five to raise their record to 7-15. The playoff odds meter is up to 21.4 percent. All is good. Right? In the short term, perhaps "good" is the wrong word: What matters is that the Knicks are "tolerable." Mike D'Antoni doesn't look like he wants to strangle himself after every game anymore, first off. That might be the point of this little run. D'Antoni couldn't stand what was happening anymore. Now he's alive again. But — and forgive us, because we are constant apologists for the Knicks' supposed Plan for the Future — at what cost? The keys to the Knicks' run over the last week have been Larry Hughes, Al Harrington, and David Lee ... none of whom are likely to be on the team next year (all right, Lee has a chance). Danilo Gallinari and Wilson Chandler are the only players guaranteed to be part of the Knicks' future who are receiving any playing time at all: First-round pick Jordan Hill hasn't played since December 2. We understand the mindset: Without a first-round draft pick next year, there's no upside to losing, unless you count "destroying Mike D'Antoni's will to live" an "upside." The organization needed a winning streak just to feel like an actual NBA franchise. But this is being done at the expense of the tiny future the Knicks have: Harrington, Hughes, and Lee are sucking up all the minutes for a quixotic playoff run to keep D'Antoni sane. We can't blame anyone involved for going this direction. But is it worth it? What exactly are we getting excited about here? The Knicks are in a position where they are eyeing a No. 8 playoff seed as their best-case scenario, not just this year, but even next year. That's fine. Winning is better than losing. Everyone needs to feel better about themselves. Just remember that no one will care what the Knicks did this season, five years from now. But decisions made today will affect that season five years from now. Objects in the mirror are closer than they appear.